Dentures are naturally retained in the mouth due to a combination of factors. Learning to eat with artificial teeth requires considerable skill and practice. This is because every person’s mouth has a different structure, which can affect the retention and stability of the denture. Also the level of suction which helps hold the denture in place, particularly the upper denture, will vary according to the amount of saliva produced. Many denture wearers find the lower denture particularly difficult to manage at first. Experience will help as will the use of a carefully selected denture fixative which can help to keep the denture in place and stable. There are relatively few of these. Current products are usually based either on a dilute solution of hypochlorite (smell of chlorine or bleach) or contain a dilute acid. Neither of these types should be used on metal dentures and the manufacturer’s labelling usually includes a note of caution about this. Although it is usually possible for old or ill-fitting to improved upon and we would be happy to assist you with our expert team of denture dentist clinicians, technicians and clinical dental technicians to help you achieve the best fitting denture possible and a new better fitting denture may be the best option that is affordable for you, continuing with poorly fitting dentures are often the last thing a patient wants and so for many years we have happily been able to help people that have until then been struggling with loose dentures by providing dental implants, either to stabilise a denture as an implant overdenture or as a fixed dental implant supported bridge with the option of “all on 4™” “teeth in a day™” “fixed teeth fast™” implant solutions. 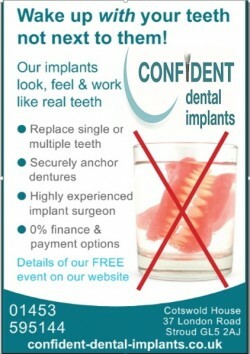 Contact us by phone 01453 595144 or email reception@confident-dental-implants.co.uk for more information on dentures dental implant costs or to arrange your free consultation with our treatment coordinator.